In my last posts I reflected on my two weeks in St. Petersburg, Russia a bit but didn’t say a whole lot about food. I’ll cram all that into this last post. While in Russia I tended to eat a heavier lunch with my colleagues during the day and then eat simply (fruit, maybe a small salad or sandwich… and some candy) at night. Several times we made pelmeni, the little meat-stuffed dumplings that I adore. At home I usually pan-fry them but my colleague gave me some tips for boiling them: add salt, a bit of oil and a touch of plain white vinegar to the cooking water. It gives the dumpling casing a little extra flavor! And in general the pelmeni were very good there. While the filling in Estonian pelmeni is sometimes weirdly squishy, the Russian ones were always satisfying and meaty. Oh my goodness, they were good. 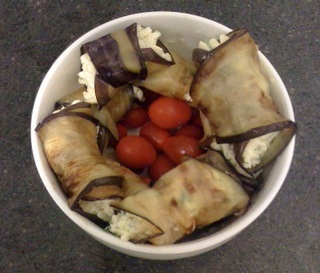 I love eggplant, and soft cool eggplant rolled around a nice rich cheese mixture? Amazing. I paired two of these with a salad for lunch. Hm… a lot of the other local goods I tasted were sweets or beer. My colleague recommended these cute walnut-shaped cookies (oreshki) to me. At first I didn’t love them, since the outer shell isn’t crispy, just sort of crumbly and bland. 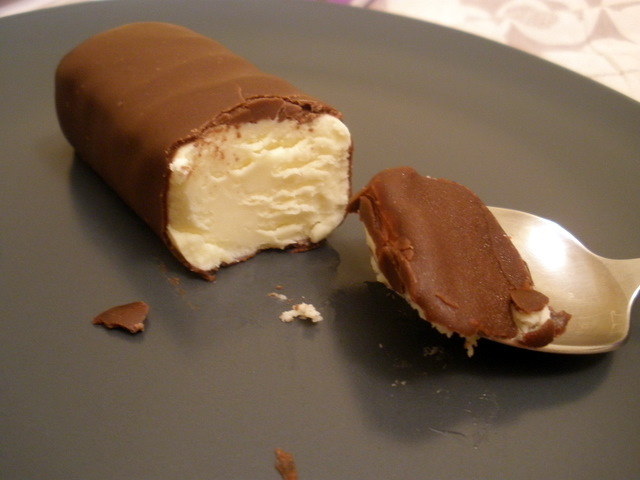 But the plain exterior combined with the caramel-like condensed milk filling was strangely addictive. I was a little embarrassed when I finished off the bag… and realized I had only purchased it the previous day. Oops. 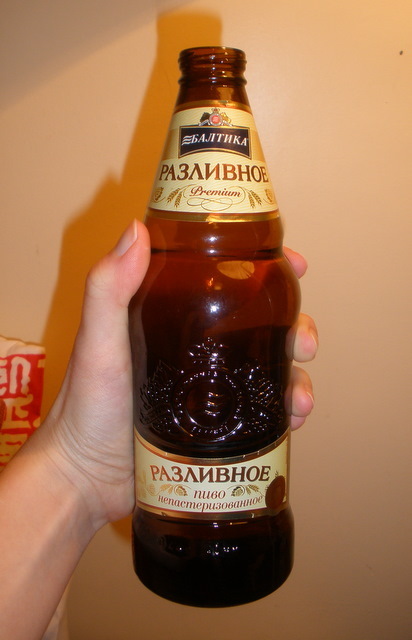 I know Russia is mostly known for its vodka, but their beer is good too. Baltika 7 and 8 are also tasty. 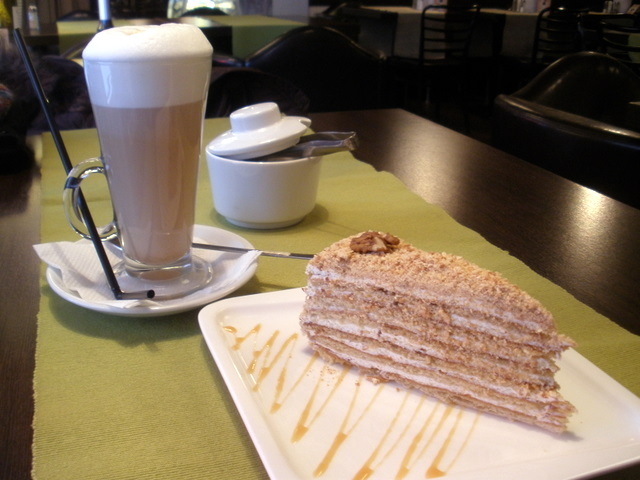 On Sunday when I was walking around I escaped from the cold for a while with a latte and a slice of medovik honey cake. I like the Estonian version of this cake, but this particular slice was so sweet. I actually felt ill after finishing it. 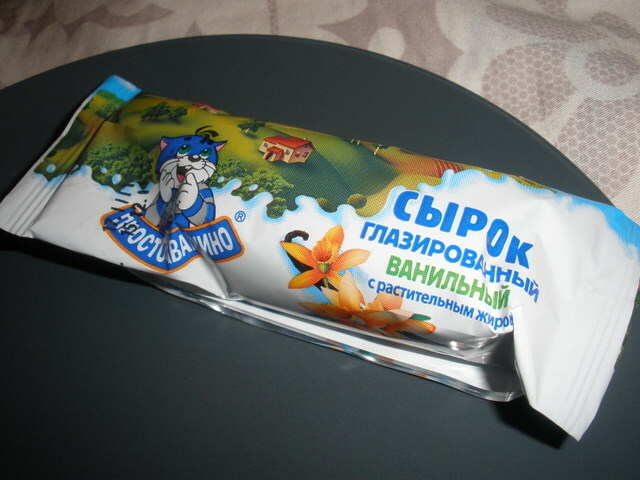 In general, I believe, the Russians like things very sweet. I encountered it with some of the chocolate candies I bought as well– some were so tooth-achingly sugary that after sampling one (or two…) I put the rest aside to bring home to J :). Here’s a Russian kohuke, the chocolate-covered cheese curd snack I like to buy in Estonia as well. 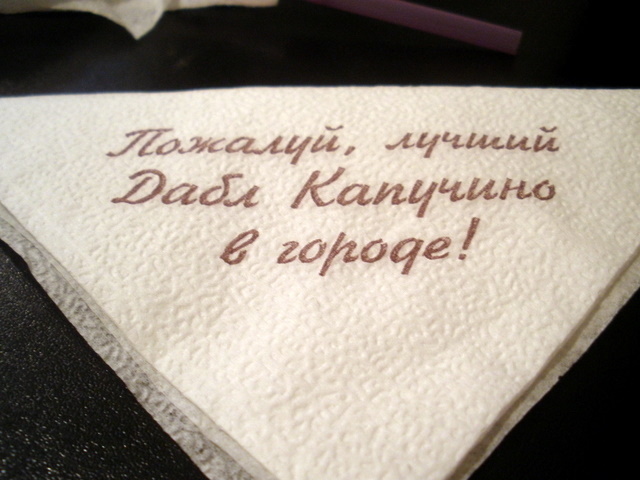 I’ve compared the Estonian ones to cheesecake before, but the Russian one was even more so. 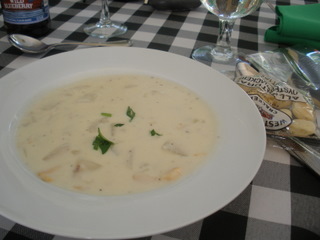 It lacked the slightly grainy texture from the curd cheese and was so creamy and rich. 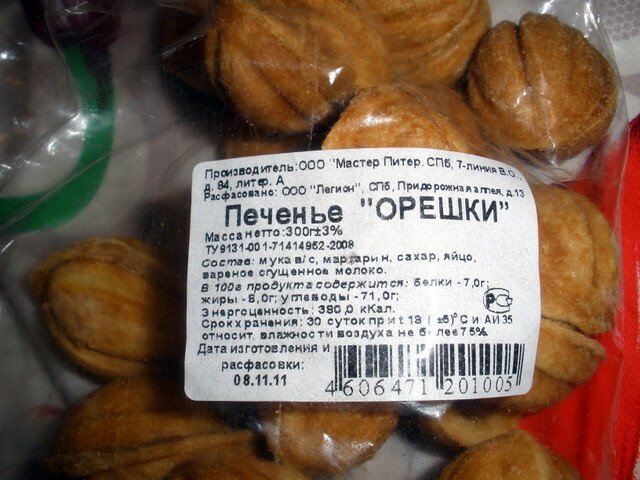 This last picture is for my friend who is learning Russian and requested more pictures of Russian text for her to decipher. Let me know how you do with this one! We actually did have one more day of fun after departing from Maryland on a Saturday evening. We landed in Copenhagen on Sunday morning and were faced with a painful 8-hour layover before our flight to Tallinn. We had considered going into the city, but after an 8-hour overnight flight during which we barely slept at all, the last thing we felt like doing was navigating a foreign subway and figuring out logistics. However, the woman we spoke to at the transfer desk was very convincing: “You know what you should do? Go into the city! It is the first sunny day in 12 days. Go.” Thanks to that gentle nudge plus the hand-drawn map she made showing exactly where the metro is and where we could get tickets, we decided to go. I’m so glad we did. Taking the subway from the airport to the city center is ridiculously easy, and when you get off at the Kongens Nytorv stop you’re only steps away from Stroget, the main pedestrian street. 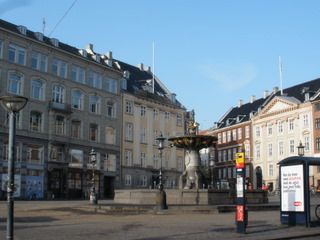 Memories came flooding back to me, as I had visited Copenhagen once before when my sister was studying there in 2007. The weather was sunny and surprisingly warm, so it was a great day for just walking around. Our first mission was to find a cafe for our morning coffee. 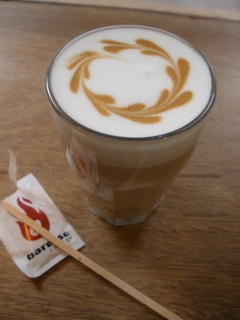 My latte was lovely and delicious. Which is good, considering I paid 7 euros for that and a plain cup of coffee for J. Copenhagen is expensive! After walking along Stroget for a while, seeing more and more Danish families emerge to enjoy a Sunday morning walk in the sunshine, we wanted a break. And a beer. 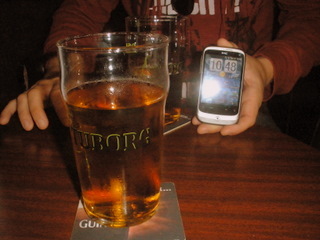 International travel and jet lag are perfectly legitimate excuses for ordering beer at 10:30 in the morning. …but I had no local cash and many shops don’t allow you to pay for such a small purchase with a card. Bummer. By early afternoon we were feeling truly zombie-like and headed back to the airport, but I think that spending time in the actual sunshine did wonders for helping our bodies clocks readjust to the time zone. After we returned home it didn’t take me long at all to recover from the jet lag. Not to mention J and I added another city to our list of European capitals we’ve visited together :). 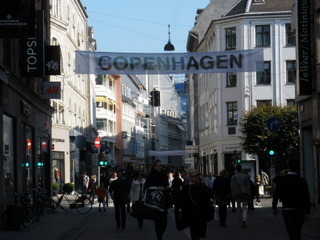 Next time we have a 4+ hour layover in Copenhagen, I definitely won’t hesitate to come enjoy the city again. 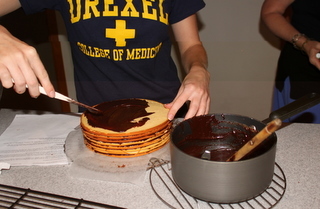 Since the party we hosted at my parents’ house last year was so much fun, we just had to do it again. Plus we were right between J and my birthdays and we realized that our combined age this year adds up to 60, plus my father’s birthday was that same week– those are reasons to celebrate, right? My parents have a wonderful house for entertaining and an extra fridge in the basement for party supplies. 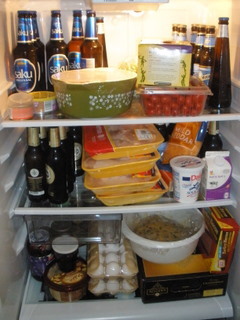 A full fridge is a beautiful sight, isn’t it? And to anyone who might say, “That’s a lot of beer!”, my response is hahahahaha… you clearly haven’t met our friends. 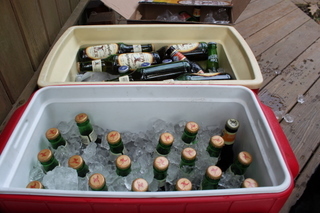 Most of this beer actually wasn’t even intended for the party, since we had another plan. 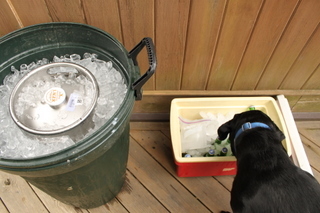 A quarter keg of Yuengling and a cooler… maybe Guinness is checking for his namesake? Then a dear family friend of ours contributed two small kegs of beer that he had made himself! It was awesome to try both of them (not to mention several others he brought in bottles for us to try), but my heart belonged to his peach weissbier— a white beer that wasn’t too sweet despite its fruity undertones. Loved it. 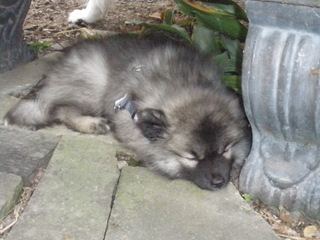 Who can resist a 9-week-old Keeshond? She’s so cuddly and looks like an Ewok! 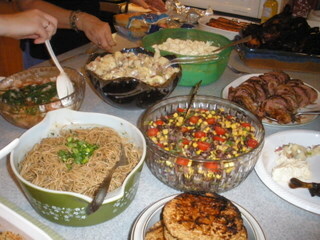 The spread included black bean salad, two different potato salads, a delicious noodle salad, marinated shrimp that disappeared in minutes, and over on the right, a bacon explosion (an infamous concoction of sausage wrapped in a bacon lattice and smoked– a family fried was willing to prepare it for us and it was so good!). There was also grilled chicken and veggie burgers. I was happy to sit down to dinner because prior to that I’d been so busy greeting guests and chatting that I hadn’t eaten any of the appetizers set out at the start of the party. Desserts were amazing— we had mini chocolate salted caramel cupcakes, two varieties of full-size cupcakes, a dense chocolate cake with raspberry coulis, gorgeous fresh berries, and a Smith Island cake made by my sister. As a special bonus, there was also two different varieties of chocolate chip cookies going head-to-head. A few weeks prior my sister and I had talked about our go-to chocolate chip cookie recipes, both of which get rave reviews, and decided to pit them against each other. I used the New York Times cookie recipe and my sister the one that comes on the back of the Crisco label. We didn’t tell anyone who made which cookies and asked people to vote for their favorite. To be honest, I wasn’t thrilled with the way mine turned out. They didn’t get as brown in my parents’ oven as they do in mine so I overbaked them a bit and they were crispy, not chewy how I like them to be. The flavor was still good but the texture was lacking. 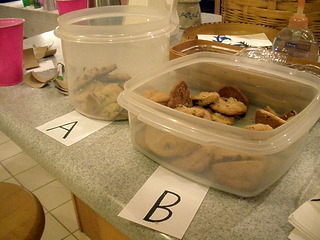 I honestly thought my sister’s nice soft cookies would win… but no, when the votes were tallied my cookies were triumphant! (My sister was a little pissed). 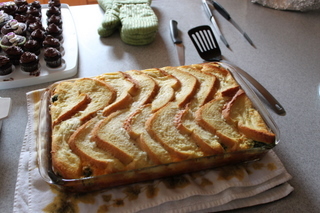 But at the end of the day they’re both good recipes– as a matter of fact, I should try the Crisco one using Estonian shortening sometime soon. Moving right along with the vacation posts! 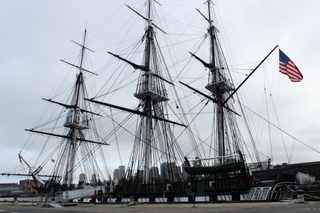 It was around September 7th that we drove from Montreal to our next stop, Boston. I’d been there a few times before since a friend went to college there, but it was all new to J. The rainy weather followed us there but we still tried to make the most of our time in the cool historical city. 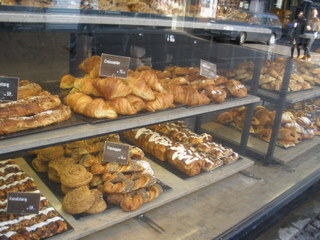 The place we stayed was in Cambridge, and on our search for coffee in the morning we came across Mariposa Bakery. It was a really cute place and both my latte and scone were delicious. 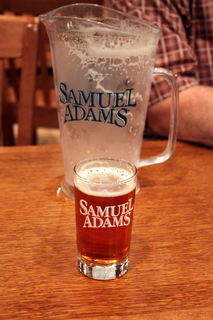 Fueled and warmed by coffee, we hopped on the T to go visit the Sam Adams brewery. If you’re ever in Boston I highly recommend the Sam Adams brewery tour. The ticket is free, though they do ask that you make a small donation, which goes to one of the two charities they support. 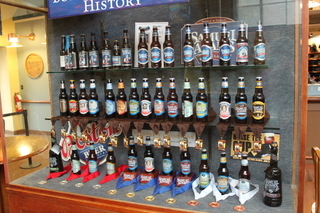 The tour is fairly short so it never gets boring and you get a free tasting glass and plenty of beer to sample :). Good deal all around! We got to try their Boston Lager (a bit too bitter for me! ), the Boston Brick Red, and I believe the Octoberfest (I didn’t take very good notes!). When we first arrived we also got to taste two new beers and vote for the one we thought should go in next year’s winter sampler pack. 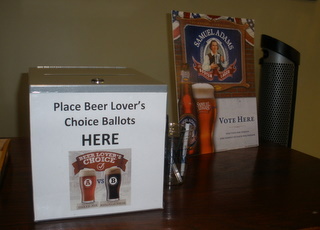 The two candidates were Oaked Ale and Maple Pecan Porter. While a heavy porter isn’t usually my first pick, I felt it had a more interesting flavor than the ale, so I gave it my vote. 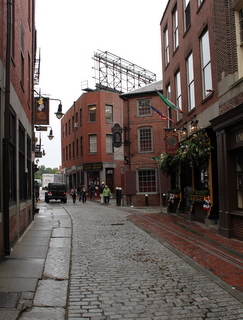 When the weather had cleared up a bit we decided to walk the whole Freedom Trail, a 2.5-mile walking trail in the center of the city that takes you past various historical sights. I think more cities should do this, since the trail of red bricks is easy to follow– no need to be constantly checking a map. When the trail took us through the North End, Boston’s Italian neighborhood, I took a little detour to get a snack from the famous Mike’s Pastry. 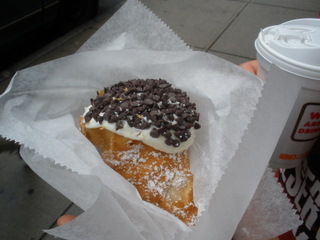 I haven’t had a cannoli in forever… mmmm. On our way out of Boston, which is home to more universities than you can possible imagine, J wanted to visit one of the most iconic– Harvard. The weather had actually cleared up by then, so we enjoyed a sunny walk around the lovely campus, got coffee, and wondered how many of the freshmen who just started studying there a week or two ago would make it through this competitive school. Maybe we hoped some smarts would rub off on us too ;). 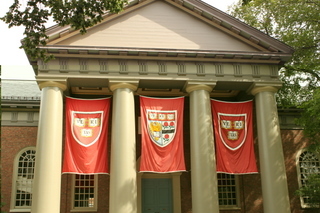 From Harvard we set off for our next destination– New York City! 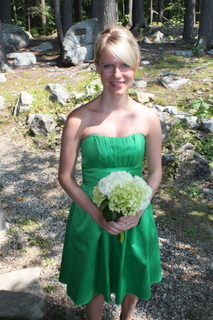 As I mentioned in the wedding post, after the festivities J and I packed up and drove our rental car to Montreal. We figured since we were already so far north, we might as well cross the border so J could get his first-ever look at Canada. 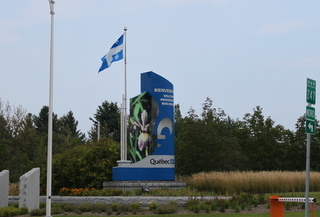 The drive up was gorgeous and we crossed the border over into Quebec with no problems. By the time we reached the city the weather had turned gray and rainy, but we braved the short walk from our hotel to Chinatown to find dinner. Big plates of tasty noodles were exactly what we needed that night. Unfortunately the rain continued the next day, so we spent slightly less time than expected exploring the city and slightly more time sheltering ourselves in bars, enjoying Canadian beers. Which is, of course, perfectly acceptable. Boreale White was one that I ordered a few times– it had a really nice citrus hint to it. When we felt ready for a snack, I knew it was time to introduce J to poutine. 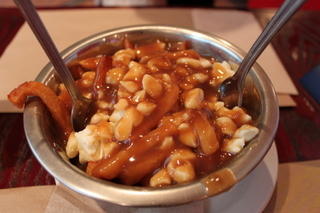 Poutine, also known as french fries with cheese curds and gravy. The bowl looked small, but there was plenty of freshly fried french fries and salty gravy to fill us both up. So good, but definitely a once-a-year (if that) treat. 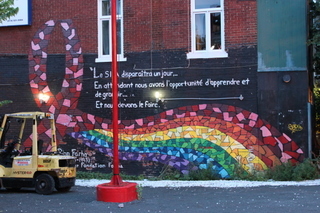 In the evening we took a walk through Montreal’s Gay Village neighborhood, which I liked a lot. The street was pedestrian-only and there were tons of nice bars, restaurants and clubs. Both of the mornings that we were there we stopped at a food court in the Desjardins shopping center for bagel sandwiches. Prior to doing research for this trip I hadn’t even known that Montreal is known for its bagels! Montreal bagels are smaller than typical American bagels (which is a good thing) with a larger hole in the middle. The layer of sesame seeds on top added some nice flavor and crunch. One local delicacy that we didn’t get the chance to try on this trip was smoked meat— we’ll have to find some of that next time! 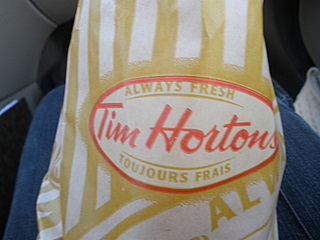 We bought some ketchup-flavored potato chips and maple syrup as souvenirs before leaving the city, and since I hadn’t actually eaten anything maple-flavored yet I got myself a maple-glazed doughnut from Tim Horton’s, the main coffee shop chain in Canada. It was great– the doughnut itself wasn’t very sweet so the soft, smooth layer of maple glaze didn’t come across as overpowering. It was the perfect snack as we crossed back over the border and headed towards Boston! 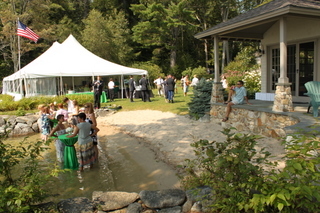 On Labor Day weekend of this year, J and I attended a very special wedding in New Hampshire. It was special not only because it was my first time being a bridesmaid, but also because I’ve known the bride since we were 12, when we bonded in Latin Club over our mutual love of Les Miz (oh yes, we were so cool it hurts). The couple lives in Columbus, Ohio (we went to visit them and their giant dog last year!) 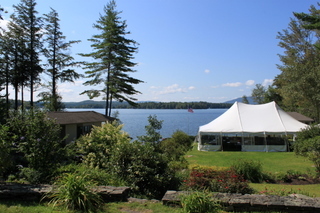 but they chose to have their wedding by Lake Winnipesaukee in New Hampshire, and for good reason– the place is absolutely gorgeous. Another reason the wedding was so special is because two of the other bridesmaids were also high school friends of mine and the bride’s. It was so great to see them, chat and catch up– like a mini reunion! We met the groom’s friends and sister the day before the wedding and after the rehearsal we all had lunch together– everyone was so warm and friendly it was almost like one big group of old friends. Later that night was the rehearsal dinner, where more fun conversations ensued, as well as some touching speeches and the giving of beautiful gifts (all purchased from Etsy) to the families, bridesmaids and groomsmen. 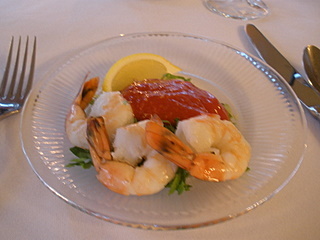 First course at dinner– yum. 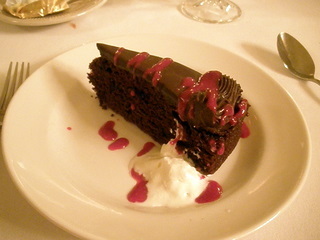 Dessert– for some reason I didn’t photograph my entree, oops! Bright and early the next morning, us ladies gathered for hair and makeup. Despite the early wake-up call it was so much fun, and I appreciated having several hours where it was just us girls. 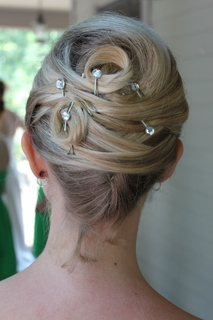 The hair and makeup ladies were so great, gushing over all of us, “You have great hair! Oh my gosh, you have gorgeous hair! I love your eyes!” etc.etc. I loved my hair too, when she was done with it! The morning was so incredibly relaxed (no stressed-out Bridezilla here!) that after we were all made up we even had time to watch the first 20-30 minutes of “The Princess Bride” before getting dressed (although we briefly contemplated delaying the wedding when we found out the bride has NEVER SEEN “The Princess Bride”. Horrors!). The ceremony itself was short, just like the couple wanted. I cried. They are just so happy to be married :). After formal photos, guests were invited to change into whatever they liked– the couple wanted the reception to be informal and fun. Us bridesmaids decided to stay in our dresses, but I did trade my heels for flip-flops. I love love loved the tables in the water! They offered a selection of microbrews during the reception– no crappy beer here :). I started with this Sea Dog Wild Blueberry, which I loved– it had a hint of blueberry without being sweet or artificial tasting. Very well done. 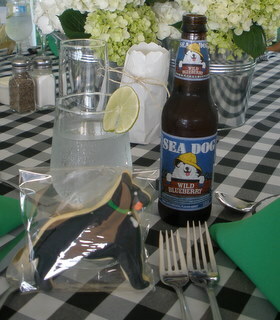 And that right next to my beer is the wedding favor– a delicious cookie in the shape of the couple’s dog, Muncher! Oooh yes. You know I love my seafood! 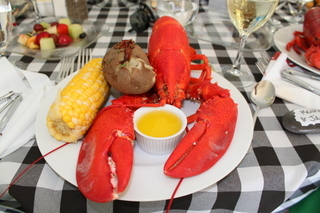 I can’t remember the last time I ate a whole lobster, but the groom made sure to come around to each table and give a quick tutorial on what to do. We were pros in no time and it was so delicious (and messy, but thanks to a bib and a thick cloth napkin my dress actually stayed clean!). 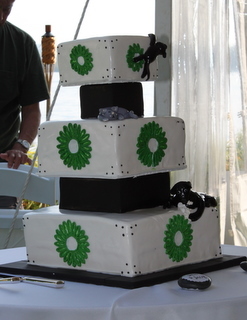 Although the couple’s Great Dane and two cats couldn’t actually be there, they were beautifully represented on the adorable wedding cake! When the cake was first cut I was too stuffed to try it, but after dancing for a few hours I snagged a piece and it was great– tasty and moist, even after sitting out for a while. I know this post has gotten long, but it was just such a great day. I was honored to be included in a celebration that truly reflected the bride and groom’s personalities and during which they themselves seemed to be having so much fun. Isn’t that how it should always be? I may have even shed a few tears the next day when we had to leave and head to Montreal, the next stop on our trip. Now I think I need to start drilling my friend for tips as to how to plan a flawless wedding :). While my favorite cold-weather drink is obviously glögg, I also like trying the special winter brews many Estonian breweries come out with in December. Many of these seasonal brews have the word jõulud or Christmas in the name, but they’re usually available through February or so. Here’s a look at some of the ones we’ve tried this winter. This is A. le Coq‘s Christmas Porter. It’s somewhat rich and not very bitter, and I should also point out that the alcohol content clocks in at 6.5%. This lightweight right here definitely doesn’t need to be drinking strong beers on a regular basis, but it was fun (hehe) to try this one. Also, if I may be nostalgic for a minute, during the first winter I ever spent in Estonia (2005) A. le Coq’s seasonal offering was a Chocolate Porter that I really liked. 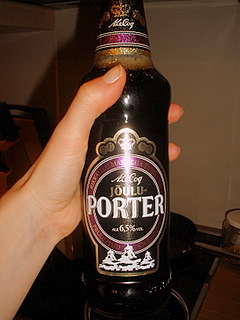 I wish they’d bring it back since the Christmas Porter definitely doesn’t have as much of a chocolate flavor. 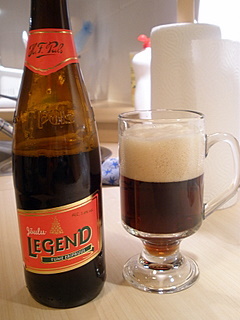 The name of Puls brewery’s holiday beer is quite dramatic– Jõulu Legend, or Christmas Legend. I unfortunately don’t remember very much about this one, except that it was pleasant enough and had a more normal alcohol content (5.4%) than the A. le Coq beer did. I actually really like this one, also by the Puls company. 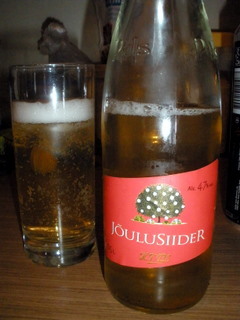 It’s Jõulusiider, or Christmas Cider. The label doesn’t say what it’s supposed to taste like, but I definitely get a taste of cranberries (or lingonberries) with a hint of cinnamon and cardamom. It’s very sweet, like Estonian ciders tend to be, but I still like the subtle spice flavors and have enjoyed a few bottles of this in recent weeks. Actually, I think I might go stock up on a few more before we get too far from the holidays and they pull these from the shelves.